In the Episcopalian world, the Christmas season lasts 12 days and ends with Epiphany, also called Twelfth Night, which celebrates the visit of the Magi to baby Jesus. 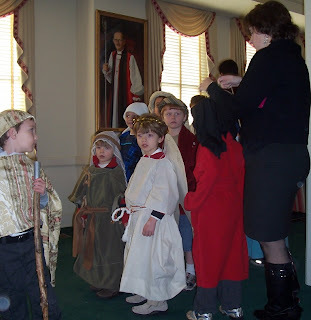 Each year our church holds a pageant, in which the story is played out by the children. This year the boys took part for the first time. They took their roles as an angel and a shepherd very seriously, so much so that any smiles at all were only in evidence when they processed up the aisle to the "shed" of made of wood and magnolia branches, a moment when cameras are not appropriate, or this fond parent would have taken some! A note on their costumes, constructed from stash materials. 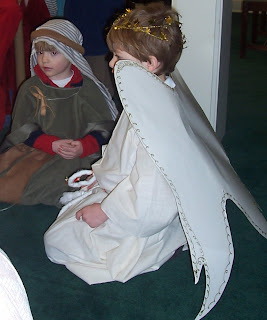 I used the age-old "pattern" for a T-garment for both the angel robe and the shepherd's robe. All that meant was folding the fabric longways, laying the boy down on it with his arms held out, and measuring for his height and arm length. Then I folded twice the needed length in half crossways so I had four layers, cut a hole for the head, and in Christopher's case, cut open the front. I used selvages where possible and hemmed the rest. I made 6-inch hems so that the boys can wear their robes for a few more years. 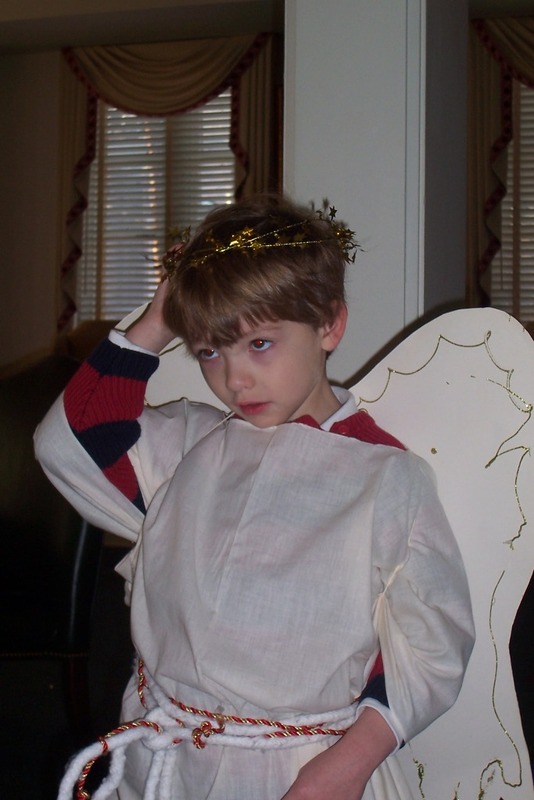 Some belts, two ties to close Christopher's robe and a headdress for him and we were done...Noah's wings and halo were courtesy the church.